My laptop’s fan has been running non-stop, and the hot air coming out of the vent was just unbearable. I installed SpeedFan to check the CPU temperature to see how hot it really was, and it ranged from 87° to 95° C. I knew this wasn’t normal since I’ve had the tablet run much cooler than that when it was new. To alleviate the problem, I tried elevating the computer to clear up the inlet vents, but that didn’t fix it. The palm rest was still uncomfortably warm to the touch, and something was really keeping the fan going. I changed my Power Options in Vista to ‘Balanced,’ but that didn’t do anything so I looked at the advanced power settings. 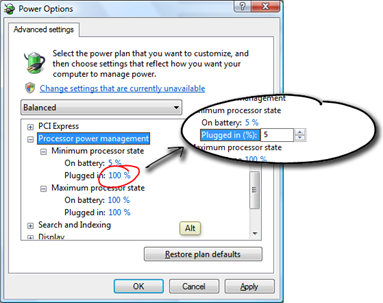 There I found that the minimum processor state, when plugged in, was set to 100%. After changing the setting to 5%, I immediately noticed the fan quieting down to a whisper. Running SpeedFan again confirmed that the CPU core was much cooler at 60° to 70° C, and it stayed in that range most of the time. If you’re having this issue, it’s worth a try to look at your Power Options first. This setting actually impacts computing performance. For some people, a number higher than 5% might be better.